WASHINGTON—House Democrats plan to pay for their health-care legislation with a big tax increase on wealthy households, aiming to raise $540 billion over the next decade with a package of surtaxes on families making $350,000 or more. 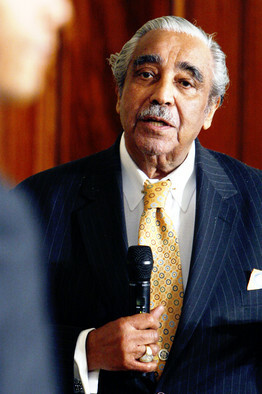 New York Rep. Charles Rangel speaks at the White House Forum on Health Reform in March. His proposed wealth surtax would begin in 2011. The House bill, expected to be formally unveiled as soon as Monday, is likely to cost $1 trillion overall. About half the cost of the bill will come from budget savings from ratcheting down payments that health-care providers receive through programs like Medicare, which covers the elderly. The balance will come from revenues generated by a graduated surtax that would begin in 2011, said New York Rep. Charles Rangel, chairman of the tax-writing House Ways and Means Committee. Upper-income families currently face a top income-tax rate of 35%, though that is scheduled to rise to 39.6% in 2011. Under the Rangel plan, married couples making $350,000 would also be subject to a 1% surtax to cover the health plan. The levy would rise to 2% for those making above $500,000 and 3% for those with incomes of $1 million or more. Around 1% of U.S. households filing tax returns make more than $350,000, according to the Internal Revenue Service. Congressional aides said the surtax rates would go higher as soon as 2013—to 2%, 3% and about 5% for each of the three levels. They added, though, that the higher rates might not kick in if other ways to pay for the health plan were found by then. Mr. Rangel offered details of the financing plan Friday after emerging from a daylong caucus of Democrats on the Ways and Means panel. House Democrats aim to convene three key committees next week to formally consider the package. The legislation, which would create a public health-insurance plan that competes with private insurers, is expected to be brought before the full House by the end of the month. But even as details are coming together, Democratic leaders are scrambling to win support from fiscal conservatives, rural Democrats and politically vulnerable freshmen who have all raised objections. Some worry the public plan will tilt the marketplace against private insurers. Others worry about the cost of the package, and fear having to vote on a bill that includes such substantial tax increases. The struggle for unity among Democrats dramatizes the larger challenge facing the majority party: whether rank-and-file Democrats are willing to stomach higher taxes in the pursuit of expanding access to health care. Throughout 2008, Mr. Obama himself signaled a readiness to raise taxes on wealthy individuals as a way to pay for his priorities. In his budget unveiled in the spring, Mr. Obama assumed the Bush tax cuts for the wealthy would expire at the end of 2010. Those higher rates would fall on couples with incomes above $250,000. Mr. Obama also proposed to limit tax deductions taken by the wealthy to help pay for heath care. A White House aide speaking on background said the majority of the funding for the health-care overhaul should come from budget savings, such as cuts in wasteful spending in Medicare and Medicaid, which provides care for the poor. The White House aide added that “Congress is making good progress” in looking for addition revenues beyond budget cuts. “There are several good ideas on the table,” the aide said, pointing to the president’s proposal to limit itemized deductions for the wealthy. Democratic leaders argued Mr. Obama’s efforts have made raising taxes on the wealthy an easier political gambit than such alternatives as taxing health benefits. Broadly, they hope to steer debate away from the cost of the bill and how to finance it. “The big debate is going to be between those who want to protect the status quo, and those who want to reform our health-care system,” said Rep. Chris Van Hollen (D., Md.). Curtis Dubay, a senior tax policy analyst at the Heritage Foundation, a conservative think tank, said the Democratic plans to raise taxes on the wealthy could backfire politically. “There certainly will be a steep price to pay,” he said. Michael Steel, a spokesman for House Minority Leader John Boehner (R., Ohio) criticized Mr. Rangel’s proposal, underscoring the Republican line of attack. “In the middle of a serious recession, with unemployment nearing double digits nationwide, the last thing we need is a tax increase on small businesses, which will cost the American economy even more jobs,” he said. Even if the House does embrace the higher income taxes, that doesn’t guarantee the levies would be part of a final health bill. Senators are separately deliberating on their own versions of a health plan, and higher taxes are likely to face more resistance in the Senate. After discarding a proposed tax on health-care benefits as too politically risky, Senate Democrats are considering a range of alternatives, including possible levies on pharmaceutical companies and insurers, as well as a surtax on wealthy individuals. Details of the Senate bill are not expected to be nailed down until later this month. Party leaders argue taxes on the wealthy are more easily defended than other levies, such as the proposed tax on health-care benefits. The issue of financing has produced a sharp debate among Democrats, in part because the issue is exposing the party to political attacks from Republicans. GOP leaders have pounded the Democrats for proposing to raise taxes during a recession, which they argue would further stunt economic growth. The Republican National Committee swatted at Democrats again Friday, saying their plan to pay for health-care legislation “would hit small businesses hard,” since small-business owners often pay their business taxes as part of their personal income taxes. Under the emerging House bill, the second increase in surtax rates wouldn’t kick in if budget savings exceed expectations and cover the cost of the bill. That was a nod toward House Majority Whip James Clyburn (D., S.C.), who suggested that putting a trigger on the surtax could mollify restive Democrats. “What I’m talking about is not unprecedented,” Mr. Clyburn said in an interview. He noted that other lawmakers are proposing a trigger for the public plan, in case other provisions in a health-care overhaul don’t lower the number of uninsured Americans as rapidly as planned. This entry was posted in Uncategorized and tagged income tax, progressive tax reform, surtax. Bookmark the permalink.